There is somewhere you must visit if you are in Minneapolis, Minnesota if you are a reader, or a parent; if you are a parent of a reader; if you are a lover of books; or if you are a lover of pets. You must visit Wild Rumpus. You know the allusion right? From Maurice Sendak’s Where the Wild Thing Are. Let’s start at the door, shall we? 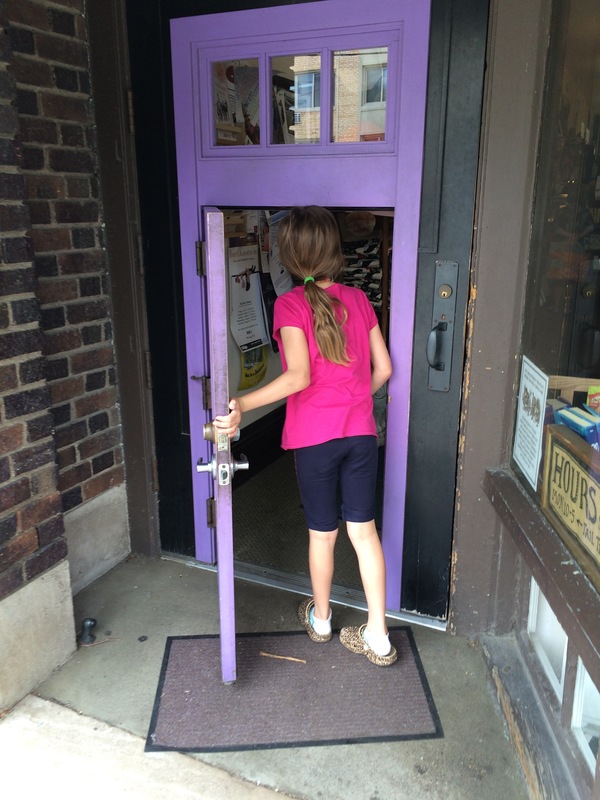 The youngest Afthead is almost too big for the small purple door built into the normal grown-up sized door. Almost too big, but not quite. 5 years now we’ve been making an annual trek to the purple door. You walk in and the store is half zoo, half pet shop, half bookstore, and half magic land. (Yes, I know that equals two, but this bookstore is greater than a single bookstore.) It has cats with no tails, chickens, doves, creepy albino rats, cockatiels, chinchillas, ferrets, tarantulas, fish hidden in the mirror in the bathroom, and a really ugly lizard. The cats are free to roam the store and their tailless ends are usually followed by a parade of children trying to grab a pet or a snuggle. The chickens are also free to roam with a similar parade of kids, but they aren’t normal chickens. They are like poodle chickens cute but a little foreign. If chickens and cats need a break they retreat behind the sales counter taunting the children with their proximity and inaccessibility. When you are done staring at the floor looking for animals your eyes travel upwards to the shelves and shelves of books. There are books taller than you can reach: picture books, beginning readers, later readers, science books, geography books and even grown up books. In the back of the store there is a scary section. The albino rats live there, and there is a hole in the floor where some other creature lives. When I was a kid, this would have been where I lived. I’ve always loved scary books. Not my kiddo though, she’s in the beginner readers picking out books she’s never seen outside of her classroom and she’s delighted. About this time you glance up to stretch your neck and notice the boat carving a path through the ceiling. Yep, in case there isn’t enough magic in this place the ceiling is actually a river with a rowboat carving a path through the white ceiling and leaving a path of blue green water behind it. If you are in Minneapolis carve out an hour and go visit. It’s right by the airport. You won’t regret a moment there. In fact, you might end up feeling like you’ve doubled your investment. A past dream of mine was to own a bookstore and this one would have been paradise for me. Books and animals! I’m hooked! It’s a great one. I loved it before I had my kiddo. My signed first edition of Lemony Snicket’s “The Bad Beginning” is from there. It’s a wonderful store. I love this place! Found a great opposites book using elephants and great vocab words like wrinkled. Such an enchanting place. Now that I have a little one, we will have to visit the next time we are in town. Thanks for the wonderful reminder of this great establishment! I was hoping someone who read this had actually visited the shop. Isn’t it amazing? My daughter loves it. It’s even better once you have a kid to share it with. Okay, a few things: I love the Afhead pics! I’ll actually BE in Minneapolis in November, so now I have somewhere to visit. This place sounds like a real-life Mr. Magorium’s Wonder Emporium. You must go if you are in Minneapolis. The street is on is filled with awesome small shops and is worth a couple of hours if you can spare them. It’s also right down the road from Lake Harriet one of my favorite lakes to walk around.